From event scheduling to sales forecasting & inventory tracking, Zenshows is mindful of the myriad of details that go into event selling so you can focus on growing your business. Running an event selling business is complex. Logistics, staffing, product, inventory management, reporting all have to be balanced. Download data from your retailer automatically. Tabulate, sort, organize, and report that data to your partners in the staffing companies and your staff on the ground at the event. Zenshows gives you all the tools and information you need to efficiently plan, manage, track and forecast your business. Monitor your field sales staff with GPS based location tracking. Automatically get the data from the vendors you need to manage your events. Streamline communications flow with online images, text messages, voicemails and documents all stored in one convenient location. Simplify accounting with payroll integration. Get the data you need every morning from your vendor to gauge your sales efforts. Communicate with your management teams through text messages, voice recordings or images sent directly from your phone. Seamless communication directly to vendor through agency approved channels. Realtime view of hours worked, online schedules, and maps and calendars for your events. Zenshows founder Mike Fullman built Zenshows from the ground up to support his own event selling business bringing eco-friendly fashion accessories to market. Zenshows includes the full suite of tools Mike developed to support the processes and best practices that helped drive revenue from zero to millions of dollars. Zenshows management and collaboration tools were created to coordinate a 20 person field sales teams dedicated to selling at Costco Roadshows. Zenshows packages Mike’s seven years of real world experience gained in every aspect of the event selling business into a cloud tool box that you can use to drive your roadshow business to new heights. For more information and access to additional tutorials and tours please reach out to us. A brief tour of the major features. This is a quick 7 minute overview of the platform. There is a lot of detail we are going to brush over and I encourage you to check out the detailed demos and training materials avaliable on this website for more information. Starting at the top level screen you can see an overview of all of your events in the system. In this case we have setup a demo vendor with completely fictional information to allow us to fully demonstrate all of the tools. From the top level page we can see all events that are active or upcoming. Lots of details are avaliable here, starting with the retailer name. We are showing mostly costco events right here, but we support over 10 different retailers and events at all of them can be combined in one view. Also visible is the retailer region, location, store number, start and end dates for the event, current status as either active or upcoming, any staff assigned to the event, and current status of your own configurable checkmarks for the event. Every vendor tracks different things on a per event and per staff level - in our case we have set it up to track W2 for staff and shipping and inventory documents. Finally to the right each event can have its own revenue goal that you can use to track and manage your staff to along with actual results to date and an event daily average. You can view this same information through the calendar view or through the tools section under block views. In block views we introduce the concept of a track. The idea is that product and demo equipment generally flows from one location to the next for event type selling to help minimize logistics costs - this concept of event flow is called a track in ZenShows. We have the events on this page as blocks with tracks along the top and dates along the left. For example we show the duncanville event on track G flowing to the Kalamazoo location. The items on this page can easily be slid around to help you route events and we also allow you to quickly see how many miles it is from one location to any previous location to minimize transportation costs. Events can also be forced to go back to the warehouse and the big numbers on each event show you how many total events that demo equipment has been out there since it was refurbished. Coming back to the top level page you can see that many of these links are clickable. We can see views of this information by track, where we see all current and upcoming events on a particular track and a map showing how things are travelling. We can also click on the region to see an overall view of all locations in a particular region. We can quickly see what our best and worst performing events are and drill into details for each of them. Whenever we see a store number we can drill into that and see all detailed history at that location along with other information and comments we want to maintain on a particular location. The event detail page has a ton of information on it. Starting with the comments section where we keep track of all details related to an event such as GPS checkins and text messages or emails. From this page we can also send text messages to our field staff and we can keep comments in here private for only our company, or share them with the agency or representative depending on our privacy settings. The logistics tab gives us details that are useful when working with shippers like pallet labels, BOLs, and it also provides a forecasted weight for your event for logistics purposes. A staffing tab is where you assign people and agencies to an event. The results tab shows you what has sold at this location so far, and the forecast tab is a a summary of our own artificial intelligence algorithms to predict sales of product at your events going forward. From this algorithm and page you can set the goals that you saw on the top level screen. The schedule tab is where you would setup schedules for induvidual staff which allows you to track their adherance to that schedule. In this case for example we have Brad assigned to a schedule today starting at 1:45 PM CDT. Up top we see a realtime view of when we are expecting a checkin for them along with their total time worked on the event so far. Finally we can capture inventory at the location - this can be entered by your field staff through their phone with a unique link that does not require a login or you can enter it directly. In addition we can analyze inventory at the location. In this case we are showing an initial starting inventory and we have actual sales and forecasted sales for this location resulting in a forecasted ending inventory. Items that are selling out are highlighted in red and in addition you can quickly scan forward or backward in time and see what inventory is forecasted to look like at future events. Of course replenishments sent to the location are automatically included in this forecast as well. The location tab allows us to see the GPS checkins for field staff at this location. The details of how to manage field staff is an entirely separate video but their are two broad areas. First, if you want, we will confirm upcoming events with your field staff ahead of time and ask them to respond either by phone, text message or email to insure they will be there. Second, if you want, on the day of the event we will send them a text message and ask them to check in or out via GPS. Represenatives can do this through voice, text message, or they can follow a link so we can get their location. All of these schedules roll up into realtime views of your field staff. The daily status page will give you a list of all checkin/outs expected on a particular day and each person will be coded green if they are there on time and location, to red if they are not, with some steps in between. Your managers can have this page up and quickly and easily see if there are issues they need to address across all your events. ZenShows can also help you track returns and has a completed events section where you can view all previous event history. Finally you can use the reports section to quickly glean valiable insights about your event history. Use the cross filter to see how average sales per day has changed over time. Or look at returns by event and item visually. Get daily reports emailed to you for overall event performance and detailed rollup in HTML or CSV. Look at your returns or revenue visually with heatmaps. Analyze revenue or deductions with a pivot table style of interface to allow you to quickly drill into average sales by year and item or by agency or by staff member. We also allow you to map your data to retail numbers if you would rather avoid sharing sensitive wholesale information with your staff. In addition, many of the reports are clickable to allow you to zoom in on details as you notice trends. That’s the basic overview and all we have time for in this video. If you would like more information please keep looking through our website or contact us for more information. Thank You! Getting started with ZenShows is fast and easy. In this video we will walk you through the setup process and highlight some of the key features of the webapp. By now you should have an email from us that looks something like this with a link in it to take you to your own personalized webapp. Its important that you run through these steps on your mobile phone that you plan to use during your events. please click on the link to start the process from your phone. This is your webapp. Its like a webpage, but can easily be saved on your phone and operates more like an application. Please make sure you keep the link to this page secret as its your personal page and does not require a login to use it. You may want to bookmark this page in your browser to make sure you can always get back to it. The first step will be for you to confirm or update your email address. Once that is completed press continue. The next step is to enter your own personal password. This can be anything you want so please use something you can remember. Don’t worry, if you forget it you can always recover your password at zenshows.com. Once you are happy with your password press continue. Now we have some policies for you to review and approve. These cover the use of Zenshows and the zenshows website. When you are ready press continue. Now we need to make sure we can communicate with your mobile phone. If your phone number for your mobile phone is correct press the “send me the code” button. If not, please edit first and then send yourself a code. Once you enter your code press confirm and continue. If there are any problems you can update your phone number and resend a code until you are successful. Now we ask you to confirm your account details are accurate. Your address may or may not be necessary depending on who you work with, but we at least need a confirmed postal code. Also make sure your timezone is accurate as this will affect many things in ZenShows if it is not. Now we are ready to confirm we can get your GPS location through your phone. For this step its especially important you are doing it on your mobile device that you will be using during your events. Also note that at any time you can text the key word LINK to zenshows to receive a link to your webapp. If you are not on your mobile phone right now go ahead and send that text to get the link from your phone. I know many of you are concerned about privacy about your location. 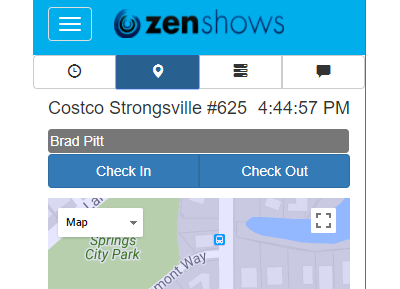 Please keep in mind that ZenShows will only acquire your location when you check in and out of an event. Your phone will start to look for your location as soon as you open the webapp page to check in and out, but nothing will be saved on our servers until you actually press the button to check in and check out. We do not keep track of where you are at any other time. This is done to protect your privacy. Scroll down and click on the LOCATE ME button. If you do not wish to use the GPS features with ZenShows then you can select the bottom button to opt out. Please note that when you start the process your phone will ask for your permission to give your location to ZenShows. Please make sure you approve this. You will see this step many times when using ZenShows and its designed to protect your privacy. If anything goes wrong with this process then you will get some recommendations for fixing the issues. If you still cannot get GPS to work please contact us at support@zenshows.com and we can assist you with getting your phone to work. Congratulations. All of the setup is complete! You are now in the main screen for zenshows. In the upper left corner you have a menu system that you can use to view some historical events, active events, and upcoming events. If no events are in the system yet please check back later as they may not be added yet. To select an event simply press on that event and the context will switch over. Lets switch to the active event first. Starting on the left, the tabs are comments, results, logistics, schedules and timesheets, checkin/checkout, and tasks. The comments page is a place where you can add pictures, send comments to the staffing agency or vendor depending on your client, and also see communications from others. You can directly add images from here through the comments as well. From the results page you can see sales data shared with you by your clients related to your events. by pressing into the numbers you can get more detailed breakdowns of each days sales. In the logistics tab you can see the status of any incoming or outgoing logistics. If your client has uploaded BOLs then you can access those here as well. Or grab pallet labels. The check in tab is second from right and allows you to use your GPS to check in and out of the event. You can use this to check in and out of your event anytime you want. You can even check in and out for breaks and lunches if your client wants you to do that. You can always see your current work status from here as well if you forgot if you are checked in or out. The timesheets/schedule tab is where you can review all your checkins so far on an event, add breaks, add checkins and checkouts, adjust times, etc. Some of these features may not be enabled depending on how your client has configured your event. Near the bottom of this page you can also see the event schedule as well. Finally the tasks tab allows you to review any forms associated with your event or fill out inventory sheets. Each of them are listed here and you can press one to edit it. Once you have completed a task it will show with a green checkmark so you always know what is done and what is not. On your inventories make sure you press the submit button after you have filled it out or zenshows may keep reminding you to do so. The submit button is the small checkmark near the top of the inventory form. For other forms the submit button may be near the bottom of the page. That wraps up our introduction. We really appreciate the time you took to review this. Our goal is to make event selling as painless as possible for you. If you have any questions, comments or suggestions, please don’t hesitate to reach out to us at support@zenshows.com. Thank You.